The Best Black Fashion Bloggers from thousands of top Black Fashion Bloggers in our index using search and social metrics. Data will be refreshed once a week. 2.73 Irony of Ashi | A Houston Fashion, Beauty & Lifestyle Blog. Black Fashion newsletter is a comprehensive summary of the day's most important blog posts and news articles from the best Black Fashion websites on the web, and delivered to your email inbox each morning. To subscribe, simply provide us with your email address. Beverly Hills, California About Blog Style Pantry is your fashion and lifestyle stockist. A network that features interviews on industry folks, street style, lookbooks, campaigns and haute finds. Folake Kuye Huntoon regularly updates her daily looks as a working mother of 3, sharing tips and secrets on where/how to shop bargains and find vintage treasures. Facebook fans 710,470. Twitter followers 21,967. New York City About Blog THE STYLE AND BEAUTY DOCTOR is the most fun and resourceful fashion and beauty guide for women of all races, ages, and sizes you'll ever come across. Facebook fans 19,219. Twitter followers 15,114. About Blog All the pretty birds covers Street style photography, style profiles, fashion obsessions and lifestyle videos by blogger and editor Tamu McPherson. Facebook fans 10,923. Twitter followers 11,153. Facebook fans 15,366. Twitter followers 10,694. London About Blog Pride has been the lifestyle bible of the woman of colour for more than two decades. Pride is unique, blending multiculturalism with modern UK living. Pride is the face of black Britain. Facebook fans 13,400. Twitter followers 12,769. Los Angeles About Blog 1966 Magazine speaks to all of the beautiful black women in the world about fashion, beauty, hair, lifestyle and travel. Meet black business women too! Facebook fans 619. Twitter followers 3,339. About Blog A collection of images rarely seen in the media. A platform for people of color to showcase their fantastic, irreverent, classic and bold fashion éclat. About Blog Super Selected is an online fashion magazine featuring black fashion models, black fashion designers and black writers and artists. SUPER.selected is Black Art, Black Fashion, Life, Black Culture, Sanity, Black Fashion Models, Black Artists, Black Film, Black Celebrity News. Facebook fans 1,825. Twitter followers 1,235. Los Angeles About Blog Candice Nikeia is a rising Life & Style blogger and her work has been featured on several popular labels. Candice experience working with brands is extensive and her education from The Fashion Institute of Design and Merchandising help her to create a unique vision through her blog. Facebook fans 2,237. Twitter followers 1,182. Philadelphia, PA About Blog D'IYANU is a ready-to-wear bold print clothing line offering quality, trendy African inspired fashion at affordable prices. Facebook fans 171,270. Twitter followers 149. Maryland About Blog Hi, I'm Ashleigh! I Teach Women How To Create A Style And Lifestyle They're In Love With. Facebook fans 116. Twitter followers 2,185. London, England About Blog Fashion, Lifestyle and Travel blog by Fisayo Longe. Mirror Me is a diary of her adventures through the world and inspiration gained along the way. Follow the diary of a Nigerian-born London Fashion blogger. Facebook fans 3,697. Twitter followers 9,503. Dallas, TX About Blog Hello there! Devoreaux here, thank you for taking a peek into the prep life! My love affair with fashion began at the age of three when I started styling my own outfits. I love fashion, it's my favorite creative outlet: we can all express our personalities, moods and interests with what we wear. I hope you enjoy exploring the preppy life with me on this journey. Facebook fans 38. Twitter followers 8,489. New York, USA About Blog Dezigner Collections is a website for fashion lovers. Chic and classy collections are put together and shared with those who have an interest in what's trending in the fashion industry and features pieces from top designers and retailers. Facebook fans 103,171. Twitter followers n/a. London About Blog Natasha Ndlovu is a model, blogger and photographer based in London, England. She writes about fashion, photography, beauty and travel, as well as shares her experiences working in the fashion industry. Facebook fans 4,740. Twitter followers 3,541. New York About Blog Hiya, I'm Cynthia. Thanks for stopping by. Based in NYC, this blog is where I share all the things I love, so please Explore. Hope you'll stop by again. Enjoy! Facebook fans 5,128. Twitter followers 2,423. Memphis, TN About Blog KPFUSION is a fashion lifestyle blog that covers of the moment fashion, style and beauty tips trends with a little Memphis, TN flavor thrown in. Facebook fans 633. Twitter followers 798. Atlanta, GA About Blog ASIYAMI GOLD is a freelance multi-faceted curator and creator. Blending a passion for design, photography, and travel, Gold fuses these creative leanings with an effortless élan that is democratic yet defies mimicry. Facebook fans n/a. Twitter followers 5,377. Jacksonville, FL About Blog My name is Thamarr and I'm a twenty something Parisian obsessed fashionista. I started Musings of a Curvy Lady in October 2012 as a way to promote personal style and beauty in this body of mine. Facebook fans 20,964. Twitter followers 1,027. Texas, USA About Blog Fashion Not Fear provides a daily dose of fearless through fashion, fitness, beauty, and style. Encouraging women to be fearless in life and fashion! Facebook fans 577. Twitter followers 187. Facebook fans 2,881. Twitter followers 970. Facebook fans 8,811. Twitter followers 5,784. South Carolina, USA About Blog Hi, Friends! I'm Tomi. I enjoy exploring all aspects of fashion, beauty, and pop culture. I was inspired to start this blog when I realized that I could combine my love for writing personal style. Facebook fans 1,318. Twitter followers 1,483. Facebook fans 5,228. Twitter followers 3,054. Atlanta, GA About Blog Blushing Black stemmed from a simple idea: to create a beautiful, digital space where I could express my thoughts, showcase creativity and share everything in between. I share content & lifestyle topics that all women could relate to. It turned out to be a safe space where women could feel like were having girl-chat on the sofa or laughing over Sunday brunch. Facebook fans 1,904. Twitter followers 726. Greensboro, North Carolina About Blog My name is Ashley and I live in Greensboro, North Carolina. I began FabEllis in late 2010. I've always had a passion for writing. At the time I started FabEllis, I mainly wrote about beauty, but due to going natural, getting married and being a working woman, it has become a lifestyle brand. Facebook fans 8,748. Twitter followers 3,756. Facebook fans 6,825. Twitter followers 3,930. Facebook fans 4,953. Twitter followers 566. Facebook fans 4,867. Twitter followers 5,234. Berlin, Germany About Blog This platform is a way for me to bring you into my world and share what I'm passionate about: fashion, photography, beauty, lifestyle and more. Facebook fans 947. Twitter followers 196. Washington, DC About Blog Washington DC based blog showcasing all things personal style, body positivity and travel with stellar photography and a sassy voice! Facebook fans 2,452. Twitter followers 2,605. About Blog I started Shapely Chic Sheri because I was (and still am) frustrated with the lack of options available to younger curvy women who want to develop their personal style. This blog is essentially my personal style journey, which includes outfit posts, my fashion rants and raves, and my advice on navigating a skinny world as a curvy girl. Facebook fans 2,037. Twitter followers 1,008. Atlanta, GA About Blog I love fashion, big hair, comfortable hotel robes and taking pictures. I'm a huge fan of DIY projects, trying out new recipes and reading books from the NY times best sellers list. Facebook fans 7,458. Twitter followers 6,347. Facebook fans 1,402. Twitter followers 118. Ireland About Blog Hi, my name is Billykiss Azeez and welcome to my blog! I'm a huge lover of anything and everything fashion and beauty related so decided to create a platform where I can express myself while also share my ever-changing life journey. Facebook fans 308. Twitter followers 687.
dc metro About Blog Hi, I'm Tashira. Welcome to politics & fashion, a place where fashion, black womanhood and social justice collide! Politics & fashion has matured into a celebration of womanhood with a twist of beauty, well-being and social justice. i hope you enjoy this space as much as i enjoy creating it. Facebook fans 477. Twitter followers 1,009. New York About Blog I created Faces of Black Fashion to celebrate black fashion and style across the African diaspora. I believe that beauty is diverse; however that beauty is not always showcased or celebrated. This blog highlight the beauty, style, and femininity of women across the African Diaspora Faces of Black fashion also celebrates the beauty and complexities of womanhood. Facebook fans 719. Twitter followers 990. Long Beach, CA About Blog I am Akia. I have always been into fashion, but faced the challenges of finding the pieces I wanted that would fit my height (6ft). If I had to define my style it wouldn’t be easy. I like what I like as long as it’s Chic, Comfortable, Versatile. Since I love to keep up with what’s new in fashion and don’t mind shopping at all, this blog helps me express myself through style & beauty. In these pages I aim to share with you what I know about the fashion world and maintaining an affordable style. Facebook fans 223. Twitter followers 269. Facebook fans 24,182. Twitter followers 895. Miami About Blog Ria Michelle is a style blogger and brand influencer living in Miami, Florida. A genuine love for social media allows her to connect with her audience. She aims to inspire by documenting her journey as it comes and captivating audiences all over the world. Facebook fans 4,342. Twitter followers 8,309. San Diego, CA About Blog San Diego, California based Fashion and Lifestyle blog about the fashion industry behind the scenes and daily life. It also includes style tips, skin care and beauty reviews. Modeling, Fashion, style and lifestyle posts that share daily life, events and a behind the scenes look in to the fashion industry. Facebook fans 316. Twitter followers 687. Ireland About Blog My name is Florence Olufemi-Ojo. A lot of people also know me as Itunu, which is my Nigerian name. I am Nigerian by birth but I've been practically raised in Ireland. So for me Ireland is home. Welcome to mouldedinsideout : Lifestyle, Culture, Beauty &Travel Blog. Facebook fans 1,624. Twitter followers n/a. Kitchener, Canada About Blog JamilaKyari.com is an African fashion and lifestyle brand that inspires women to live a colourful, vibrant and bold life. It achieves this through the showcase of bright colours, vibrant prints and bold patterns in women's apparel, home decor, stationery and gifts. Content includes style posts, product reviews and lifestyle tips tricks with an African twist. Facebook fans 42,255. Twitter followers 85. About Blog That silly girl enjoying life is me. I'm 29 years old first-generation Haitian American who on her spare time watches superhero shows on the CW (we have a love-hate relationship). Keep up with articles on Fashion & Lifestyle from Embracing Nelle. Chicago, IL About Blog Serving fashion junkies, style lovers, beauty addicts and travel enthusiast with inspirational stories and content to embrace your individuality and live your best life now. This is the It Girl's fashion and lifestyle source to be entertained, enlightened and encouraged to live life happy with great style and with pure intention. Browse our curated closet for great finds and unique pieces. Facebook fans 897. Twitter followers 45. New York About Blog I'm a millennial with a deep love for fashion. I'm a little bit cool and a little bit awkward. Here I will be serving up some fashion inspo and life tips to help you live your best life. Facebook fans 75. Twitter followers 19. Basel, Switzerland About Blog More than just hair, make up and beauty! Facebook fans 3,052. Twitter followers 3. About Blog Welcome to DyandraRaye.com, a fashion & travel website designed to elevate your lifestyle! Growing up with a serious style influence I noticed how deeply rooted both passions were to me. I started as my Mom's guinea pig for her designs while hopping on flights to see the world with my Dad. Unknown to me then, fashion and travel would be a way to open my eyes to the world and inspire my lifestyle. Facebook fans 691. Twitter followers n/a. Facebook fans 991. Twitter followers 1,229. About Blog 21-year-old residing in Winnipeg. I love dressing for any event, in that way i try to always put my best foot forward. Every day is an opportunity for a new look. Facebook fans 471. Twitter followers 245. New York, NY About Blog Whitney Madueke is a Fashion & Beauty Blogger, Model, Youtuber and Aspiring Fashion Designer. Desourire is a platform used to share my creative take on fashion, style, and beauty. this blog celebrates my different sides influenced by the places that I have lived and called my home. With a background in Law and a never dying passion in fashion, here I am. Facebook fans 1,397. Twitter followers 1,904. Facebook fans 187. Twitter followers 88. Fresno, TX About Blog Hello! My name is Yolanda Renee. I'm a petite girl trying to make it in this fashion world. So sit back and enjoy my fashion! Facebook fans 108. Twitter followers 548. London, England About Blog Shirley is a Blogger from London. She loves expressing herself through her love for fashion, her personal style, photography and in writing. Facebook fans 275,404. Twitter followers 86,240. Facebook fans 219,740. Twitter followers 61,368. About Blog Hey, It’s Mel Bae! A born & raised Brooklyn bae in my twenties sharing my NYC (and worldwide) adventures. My blog is all things lifestyle, beauty & eats. Also known as a few of the best things in life. Facebook fans 79,679. Twitter followers 11,534. NYC About Blog Glamazons Blog covers the highs and lows of their journey as two small town girls trying to make it in New York's cutthroat publishing industry. Experts in the realm of everything beauty, fashion and entertainment, these two self-certified glamour girls are not only adept at reporting on the trends but they're also ahead of the curve when it comes to spotting what's new, hot and next. Facebook fans 8,452. Twitter followers 6,418. NJ/NYC/Miami About Blog Chante`sought to show plus size women that weight should not hinder one's ability to travel, dress well nor stop them from enjoying life. E.C.A.C blog and social networks will influence women to be healthy, confident, and chic. Facebook fans 193,102. Twitter followers 5,125. 73. Irony of Ashi | A Houston Fashion, Beauty & Lifestyle Blog. Texas About Blog A fashion and Life Style Blog based in Houston Texas, Agatha, who blogs about Daily fashion, Blogger Trends, lifestyle, Beauty and More. NYC About Blog Style blogger, social media specialist and digital media maven Christina S. Brown is a New York native and the founder of fast-growing lifestyle destination LoveBrownSugar.com. Recognized everywhere from The New York Times to Essence Magazine as a top lifestyle blog, LoveBrownSugar.com focuses on fashion and beauty for multicultural women with an emphasis on self-empowerment. Facebook fans 10,948. Twitter followers 12,468. Facebook fans 14,587. Twitter followers 2,134. About Blog Noordinaryshe is here to help me formally document looks that I create, otherwise known as taking my pleasure seriously and also to inspire every one of you on everyday styling, fashion trend, beauty and shopping tips and how to maximise your wardrobe collection. I would have to confess at this point that I love bargains and do most of my shopping when prices are a bit friendlier. Facebook fans 3,888. Twitter followers n/a. New Jersey About Blog Kyrzayda.com is your first and best source for all of the information you're looking for. From general topics to more of what you would expect to find here, kyrzayda.com has it all. We hope you find what you are searching for! Facebook fans 4,421. Twitter followers 3,126. Minnesota About Blog Join me in my journey of self discovery as I try to figure out what to wear and who to be. But then again who isn't? So we can be in this together! I started this blog as a creative outlet and I get newer and brighter ideas each day of the direction I'd love to see it go in. I am excited for this venture in my life and you should be too! Toronto, Canada About Blog This blog provides fashion lovers alike with style inspirations and where to shop tips from the eyes of this Jamaican-Torontonian girl named Kimberly. Facebook fans 191. Twitter followers 157. Facebook fans 98. Twitter followers 75. Berlin - London - NY About Blog Minnie Seibt lives between London and Berlin and has been working in fashion for 7 years. She founded Minnie Knows in February 2011. It is her a creative outlet, where she shares her love for fashion, style and design with the world. She regularly updates her space always striving to inspire and motivate her readers to dream big. She has worked with and for multiple brands and contributed to different fashion and lifestyle magazines. Facebook fans 989. Twitter followers 925. Facebook fans 35,749. Twitter followers 7,279. Nairobi, Kenya About Blog Nancie's love for fashion began as a young girl with her dream to become a professional fashion designer, who knew that years dressing up barbie dolls in original creations would lead her to a career in the fashion industry. Her blog is an amazing webzine covering topics from fashion to lifestyle to fitness and anything that affects women in general. Facebook fans 2,563. Twitter followers 12,249. About Blog HI, I'M Natalie. Have you ever had a-nothing-to-wear day? Me too. One day I decided to write about it. Welcome to my Tiny Closet. Where I chronicle my daily adventures in personal style. Facebook fans 7,064. Twitter followers 597. 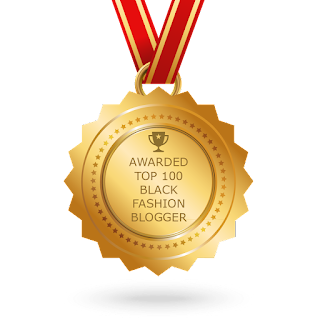 CONGRATULATIONS to every blogger that has made this Top Black Fashion Bloggers list! This is the most comprehensive list of best Black Fashion Bloggers on the internet and I’m honoured to have you as part of this! I personally give you a high-five and want to thank you for your contribution to this world.